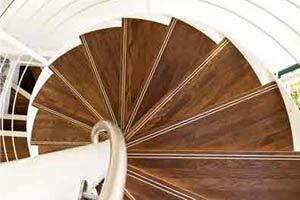 A Premium kit spiral stair in oak beech or ash. Custom made external spiral stairs in steel. 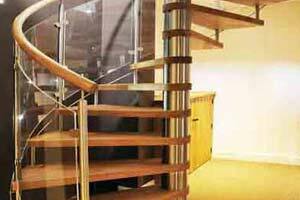 Complete Stair Systems have an unrivalled selection of spiral staircases for domestic and commercial applications across the UK. These range from basic DIY kit spirals systems to more custom made models with glass and stainless steel, all in a variety of heights and diameters. We have been suppling new builds and refurbishments with ‘focal point’ access solutions across the UK and Ireland since 2005. Spiral Staircases have been used in construction for over 3000 years. The initial concept of a spiral staircase was one of safety and defence and were commonly used in the Middle Ages in castles and forts. Their twisting nature put attacking armies at a disadvantage by not being able to flood the building with soldiers. They were built in a clockwise assent so a right handed, sword wielding intruder would struggle with the centre column whilst a solider defending the castle would have more room to manoeuvre. These early spiral staircases would also have uneven steps both in height and depth, again to outwit unwanted intruders. 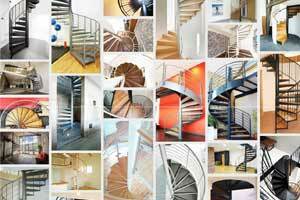 In more recent times spiral stairs and helical stairs are associated with elegance, style and ergonomic design. Being an architectural centrepiece, they are located in many of the world’s most iconic buildings and remain a very space saving solution when accessing an upper level. We have divided our range into 6 different models / categories, each with its own characteristics, different diameters and material choices. 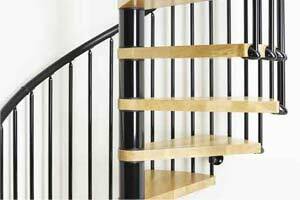 To work out a price for any of our spiral staircases we need to know a floor to floor height and diameter along with the model of choice and an idea of materials you would like to use. 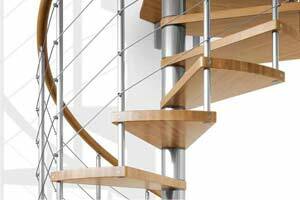 Don’t worry if you don’t have a 100% precise height or are unsure about the diameter or indeed have still to make up your mind about the materials – each spiral is priced per step and we can give different treads or balustrade options within the price. It is all very easy! Have a look at the models below and fill out the enquiry form on each page. 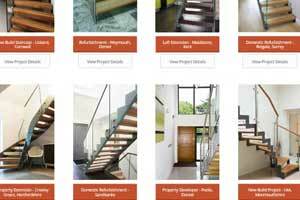 We have an extensive case studies portfolio and gallery section for inspiration to help you choose your feature spiral staircase. 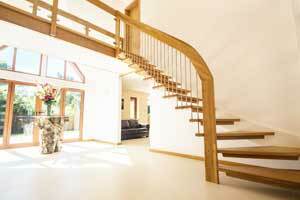 There are several characteristics that one needs to be aware of when planning and purchasing a spiral staircase. The image to the right highlights several elements of a spiral but it is the geometry which sometimes confuses. Any questions about diameters, stairwell opening, entry and exit points and materials, please call 01794 522444 or email info@completestairsystems.co.uk. 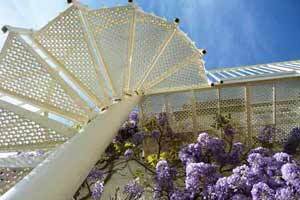 Don’t be too concerned about the technical elements of a spiral – we look after all of these for you. The following is merely to provide some guidance. What Diameter of spiral do I require? The guidance on diameters are set out by a British Standard 5395 part 2. This document divides spiral staircases into 5 categories depending on their usage and sets ‘clear tread width’ requirements for all. This in turn dictates the overall diameter. 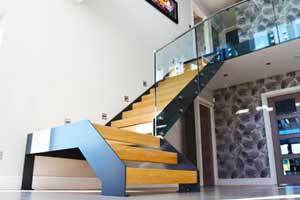 A spiral accessing a loft space or a non habitable room in a house (category A) requires a clear tread with of 600mm. With the centre column and handrails to both sides this works out to be an overall diameter of 1400-1500mm depending on the spiral model. 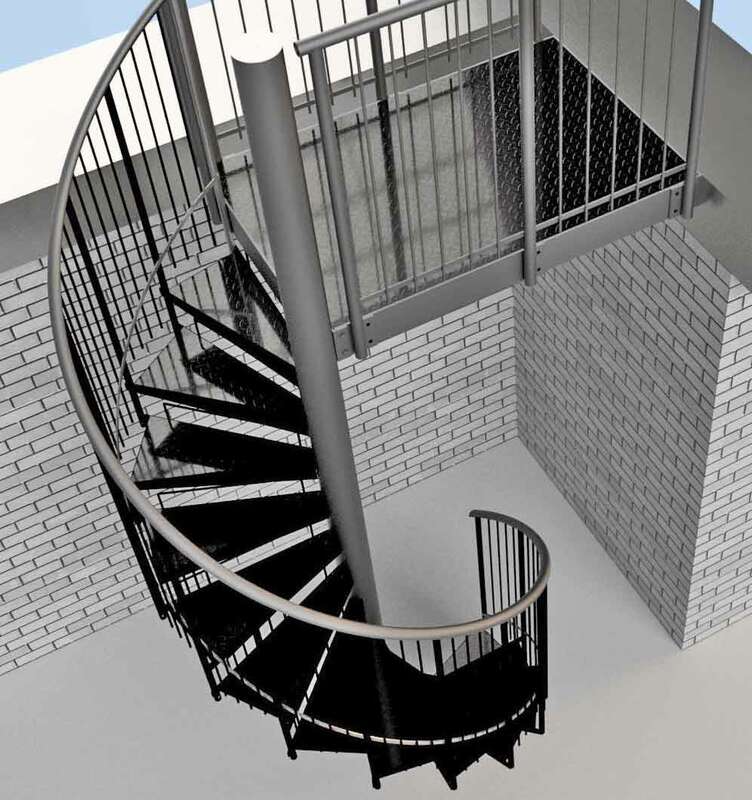 A spiral acting as the main stair in a house (category B) requires an 800mm clear tread width (900mm in Scotland) which is around an 1800-1900mm outside diameter. Understandably, commercial spirals require a larger tread width which is determined by the number and type of person likely to use the spiral – staff or public or both. 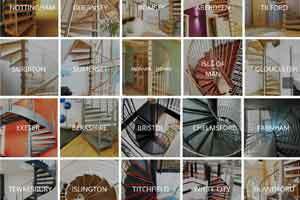 Our blog post ‘What diameter Spiral Staircase do I need‘ goes into a little more detail. The overall decision of the diameter of the spiral will rest with the building inspector involved with the project. What size of stairwell do I require for my Spiral Stair? If you are creating a circular or square hole in the floor you need to know the size required. Simply add 100m to the size of the diameter of the spiral you are proposing. If you are installing a 1500mm diameter for example, the opening in the floor should be 1600 x 1600mm or 1600mm diameter. These are minimum figures of course and these dims should take into account any finishes around the opening like plasterboard. This is to allow sufficient knuckle gap around the perimeter handrail so you don’t pinch your figures as you use the spiral as the handrail passes through the floor. There are a few tricks to reduce this ‘plus 100mm’ rule but it depend on the model, the diameter and the location of any walls. 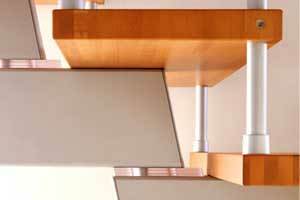 For a little more information on this please have a look at our blog guide on ‘What floor opening do I need for my spiral stair‘. Spirals are designed to the building and the layout within. Designers take into consideration the flow of the building and how the spiral is most likely to be approached downstairs and upstairs. Generally a spiral has to start downstairs in a certain position or the upstairs platform has to be located in a fixed position. If you take one of these fixed starting points, the rest of the spiral will spin around and using the step depth and heights set by the building regulations, will end up where it ends up. The two images on the right show a plan drawing of a typical 1500mm and 1800mm domestic spiral with a normal floor to floor height.